Berlin’s never-ending process of renovation is characterized by familiar and grotty-looking buildings disappearing behind scaffolding and tarpaulin for months on end, and then emerging some time later with a garish new paint job. Preferably canary yellow. 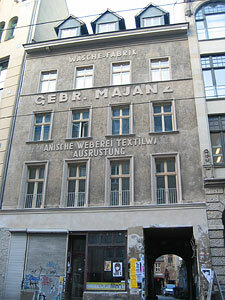 This building on Rosenthaler Straße just stepped out of its packaging where it spent nearly a year hidden behind revolving underwear and deodorant adverts. And it looks exactly the same as before. Just as drab, but somehow buffed-looking. They didn’t even bother to repair damage to the beautiful lettering. Bravo! This kind of low-key-renovation is something Berlin needs more of. Instead of removing signs of damage and age, just preserve it. I once read that dirty old masterpieces are cleaned with saliva applied with delicate cotton swabs. Maybe they tried that here too.